Whenever someone has asked about my hobbies I've always replied "....Photography?". While this is true, photography has been my hobby-turned-career for a while now and I have recently discovered a new love - food photography! Okay, okay. So it is still photography but now I get to photograph FOOD and EAT it and TALK about it! So I guess it would be easier to say my hobbies are eating and photography.... yeah, that's accurate. I grew up in a multicultural household. My father is Chinese, born in Hong Kong, home to some of the best street food you can find. My whole life I was exposed to all kinds of food and to this day Asian food is hands down my favorite. You can imagine my excitement when I get to try new restaurants that serve foods reminding me of my childhood and I was just as excited to eat at Kai Asian Street Fare. Looking at the menu it was easy to see that pretty much anything you ordered would be amazing. They have everything from wontons, Korean style chicken wings, Asian tacos and loaded fries. Not to mention things like soup and noodles - a staple of any Asian restaurant. They even have dessert! Cheesecake combined with matcha (green tea powder) which sounds absolutely perfect. Unfortunately I didn't get to try the cheesecake this time around (I love cheesecake!) but will definitely spring for it next time I visit. This is what I ordered: Tay-Tay Tacos, K-Pop and Lock Loaded Fries, On Fleek Wontons, and Soy-Garlic Korean Style Wings. Don't worry, I didn't eat all of this alone! My husband, Brandon, came along for the ride as he also loves Asian food and would have died had I gone without him. I felt a little awkward whipping out my camera every time a new dish was brought out to us but I am so glad I did because the food was as delicious looking as it was to eat. The Tay-Tay tacos were absolutely amazing! 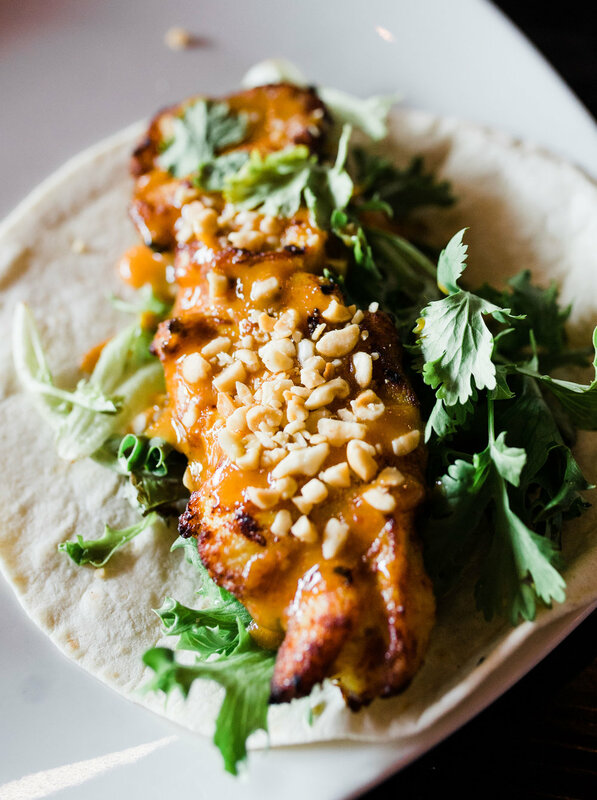 The texture of the chicken combined with the delicious sauce and crunchy peanut pieces made this dish extremely satisfying. If you feel unsure about all of the other menu items I would say that this is a safe bet. Unless you're allergic to peanuts, then don't eat it. Next we received the K-Pop and Lock loaded fries. The fries are a different texture than what you might expect when you order fries but in a more fresh and crispy way. The extra crispiness definitely helps with all of the sauce and bulgogi (Korean style beef) layered on top and overall I really loved this dish. It was a little spicy and I went through many cups of water (I'm a wimp when it comes to spiciness) but I would definitely order this again! The other option for loaded fries was called the "Gojira" which made me SO HAPPY. 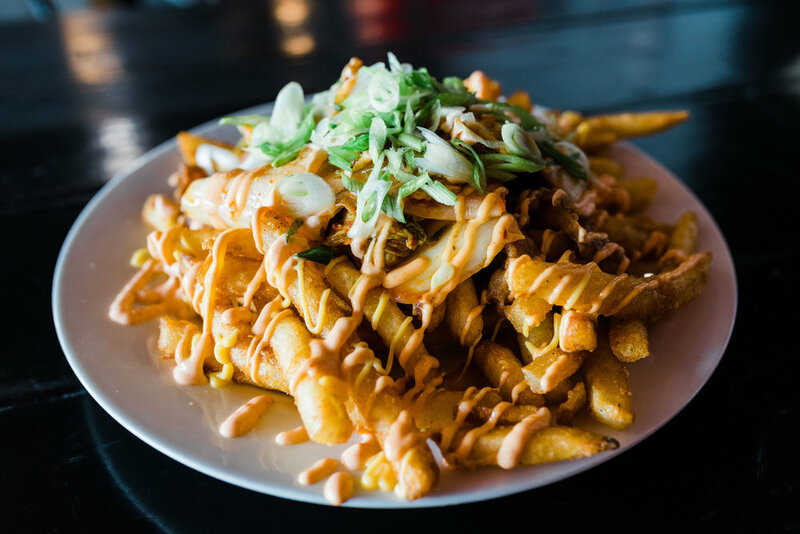 If you're not a nerd like me then let me explain to you... "Gojira" is the Japanese word for Godzilla and the Gojira loaded fries are Japanese style. Get it? Well, it made my day at least. These On-Fleek Wontons made my little half-Asian heart so happy! They are filled with pork and shrimp with an amazing chili soy based sauce on top. They are basically dumplings but the way the dough is folded makes them wontons. Either way I want them in my tummy! I also love steamed foods so that was also a bonus for me. Last but certainly not least are the Soy-Garlic Korean Style Wings. When Brandon ordered a plate of five wings, I thought "Only five? That won't be enough!". I was pleasantly surprised when the dish came out and the wings were much larger than any wings I am used to eating. The sweet sauce on these wings was a nice reprieve from the spiciness of the K-Pop loaded fries and made my mouth very happy. As with everything else, they were freshly cooked and I could definitely tell. The outside was just the right amount of crunchiness with the meat inside being very moist and tender. I am practically drooling as I write this, thinking about how good they tasted. Definitely a must order if you plan to visit! Overall, Kai Asian Street Fare is a great little find and I will definitely be returning. If you want to see their entire menu then you can visit their website here and make sure to bring a lot of friends so that you can order several dishes and sample everything! Liked this blog? Want me to do more reviews of local eateries? Let me know down below!